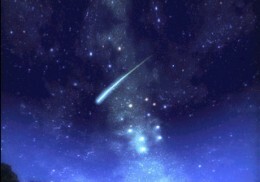 Whether your wish is selfish or altruistic all of us at times feel the need to cast out our nets and ask for our dreams to be fulfilled by the magic contained within a chicken-bone or a falling star. It's like praying but without resorting to begging favours from the big guy(s) upstairs. * Wish upon: The Moon - Yet another birthday wish, so on the evening of your birthday look towards the full-moon and make a wish. It is said that if the moon crescent points up your wish will go unfulfilled, whilst if the crescent points down your wish will be granted, whilst a full-moon will provide the wisher with a full year of good-luck. Zoos? Thats wierd. Around here, people wish on 11:11. And someone once told me that if you can drink all your milk before the bubbles pop, you get a wish. I have also heard of wishing on those tiny red spiders, if you see one, turn around three times fast while making a wish, if you can still see it (and squishing it so it stays is cheating) then your wish will come true. Thus far into my life, the only way any of my wishes have come true though, is if I made them. Everyone forgot the dandelions! I make a wish on them everytime I see them. i seen a beautiful rainbow before and i did make a wish but i didnt draw or make a cross on thr ground...would that be the reason why my wish won't comes true...?? something about the 11:11 wish. you must make the wish then kiss the clock that says 11:11 (you can blow a kiss) before it reaches 11:12. i have also heard that it only works if u make the wish at 11:11PM but i dont believe that it matters if it is 11:11AM or PM. I believe you can make 11:11 wishes. If you believe your wish will come true you will make it happen!